Monday– Ground turkey and black bean quesadilla. I used the left over ground turkey from the turkey tacos last week. This is another great, quick dinner idea! Cover half the wrap with the ground turkey and black beans, layer with your choice of shredded cheese. Cook in a skillet over medium high heat, until brown and cheese is melted. Flip once. Tuesday– Smoked brisket. Dinner at my parents’ house tonight. My dad used his smoker and made some mean smoked brisket with a sauce. He smoked an 8 lb brisket! Seasoned with mustard and a rub! Here’s the recipe! Combine all the rub ingredients in a medium bowl and mix well. Set aside. 1. Prepare the brisket by trimming away any sliver skin. 2. Rub the brisket with a mustard of your choce, yellow or spiced. 3. Season the brisket liberally with the rub. Pat it in. Wrap the brisket in saran wrap or allow it to sit in a container until ready to smoke. Over night is best. 1. Take your brisket out of the refrigerator to warm to room temp. 2. Prepare your smoker. I used Jack Daniels Hickory chips and apple wood. Soak the chips for thirty minutes at least before adding to your fire. 3. Adjust the temperature of the smoker to 225 degrees. 4. Add the brisket fat side up. 5. Cook until the internal temp is 160 degrees. 6. Take the brisket off and double wrap it in aluminum foil. Add beef stock and apple cider to the foil, about 1 cup total, and return to the smoker. 7. Cook until 185 degrees. Take off and wrap in a towel and place in a cooler to rest. 8. Slice against the grain any where from 1 to 3 hours later. 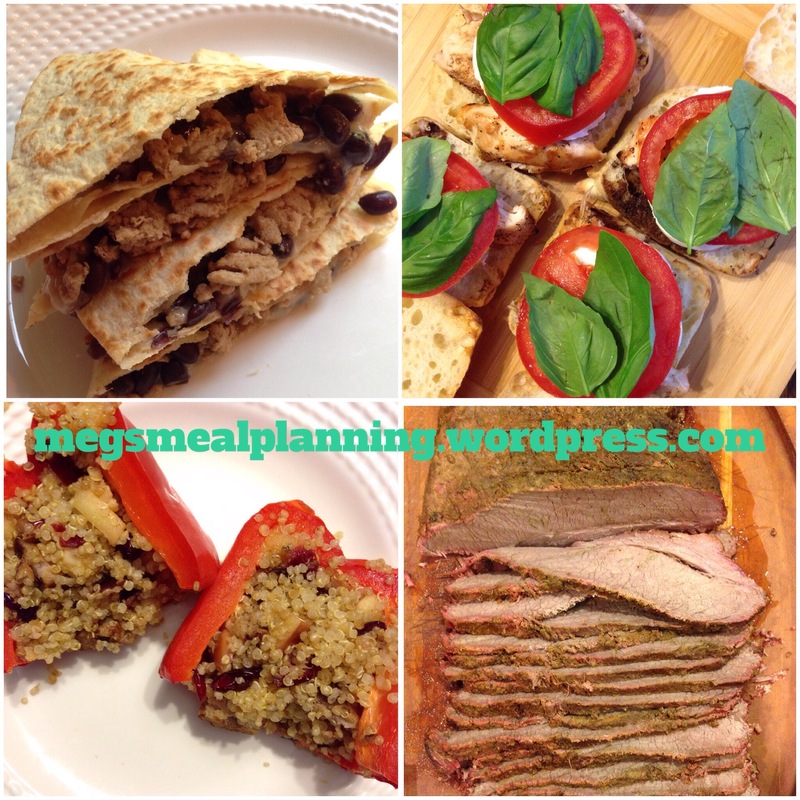 Wednesday– Chicken apple sausage and quinoa stuff peppers. This recipe is fairly quick, about 30 minutes. This will make enough for two peppers, plus leave you with enough left over for lunch the next day! Score – dinner and lunch made in one meal! Thursday– Grilled chicken, fresh mozzarella, basil, and tomato panini. This is another easy dinner. Love those! All you need to do is grill the chicken, toast the panani, then build your sandwich. I like to add balasmic vinegar to mine. Friday– Cheeseburgers with sweet potato fries and roasted broccoli. Happy Friday!